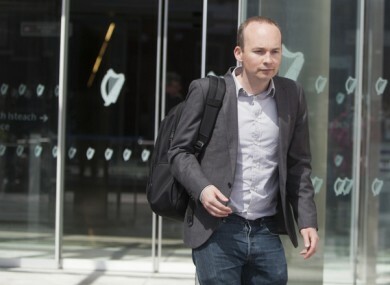 A GARDA HAS been accused of lying “in a dishonest and disreputable fashion” about Solidarity TD Paul Murphy’s actions on the day of a water protest in 2014. Sean Guerin SC, defending Murphy, suggested to Garda Gavin Cooke that he had deliberately toned down his “false” evidence in a “cowardly” way, Dublin Circuit Criminal Court heard today. Cooke rejected the claims while giving evidence on day 13 of the trial. Murphy along with South Dublin Councillors Michael Murphy (53) and Kieran Mahon (39) and four other men have pleaded not guilty to falsely imprisoning then Tánasite Joan Burton and her advisor Karen O’Connell by restricting their personal liberty without their consent at Fortunestown Road, Jobstown, Tallaght on 15 November, 2014. The two women were attending a graduation ceremony at An Cosán adult education centre in Jobstown when anti-water charges protesters began demonstrating around them. They were trapped in cars for about three hours, the trial has heard. Cooke was the driver of the first car Burton and O’Connell remained in at a local church for about an hour, the trial heard. At one point, Cooke described seeing Paul Murphy on a microphone “doing different things”. Under cross-examination from Guerin, he said he saw Murphy directing people where to stand. The court was then shown CCTV footage from the relevant period, which Guerin said to Cooke “gives the lie to your evidence”. “You weren’t even in the church grounds for most of the time Mr Murphy was there,” Guerin said. “What you’re telling the jury is that you saw something that couldn’t have happened,” Guerin said. He put it to Cooke that as well as saying in his statement that Murphy was directing people, he also gave evidence to that effect in another case in the District Court when Murphy was not on trial. Guerin said Cooke then tried to “tone down” his evidence in this trial by initially saying he saw Murphy doing “different things”. “I suggest to you not only did you deliberately falsify your account of what happened, you gave false evidence in the District Court and [moved] away from your falsehood in a dishonest and disreputable fashion because you knew your statement was false,” Guerin said. “That’s not true,” Cooke replied. He said he gave a true statement and has always spoken the truth in court. Cooke denied this was the case. Under questioning from prosecution barrister Tony McGillicuddy BL, Cooke described how the protesters were shouting “vile” language as they surrounded the car. He said after helping to move Burton and O’Connell from the car to a jeep, he saw two gardaí being assaulted by protesters. He said he received “two boxes in the back of the head”. Paul Murphy of Kingswood Heights, Tallaght; Kieran Mahon of Holbrook Grove, Tallaght; Michael Murphy of Whitechurch Way, Ballyboden, Dublin; Frank Donaghy (71) of Alpine Rise, Tallaght; Ken Purcell (50) of Kiltalown Green, Tallaght; Michael Banks (46) of Brookview Green, Tallaght and Scott Masterson (34) of Carrigmore Drive, Tallaght have denied the charges. Email “Paul Murphy's lawyer accuses garda of lying 'in a disreputable fashion'”. Feedback on “Paul Murphy's lawyer accuses garda of lying 'in a disreputable fashion'”.